The new Kobo Touch is one of the thinnest, smallest eBook readers available. It comes in 5 colors: Black, White, Blue, Silver and Lilac. The device is quite smart and minimalistic and features just one button on the front which is the Home button. It has a soft feel on the front and a really nice soft quilted back. On the top of the device there is the Power button with a nice LED light which when blue indicates it is fully charged and when re/violet it indicates it is charging. Charging is done via the USB cable connecting to your computer or laptop. There is an AC adapter also available, but this is extra. There is also a micro SD slot on the side to upgrade the memory (32GB max) from the standard 2GB. There is no audio on this device so you can’t buy audio books or listen to MP3s. Also there are no hardware buttons for page turning. The Kobo features the usual Pearl eInk 16 greyscale screen. The screen contrast is almost as good as the Kindles and Nook Simple Touch, but not up to that of the Sony PRS-T1. The Kobo like the Kindles and Nook Simple Touch does a full refresh after every 6 pages. This means you only that flash to black photo negative look every 6 pages. While this is good, what I did notice on this device unlike the others is after 3 or 4 pages you start to get a slight ghosting effect. This disappears after the full 6 page refresh. Luckily you can change how often the device does a full refresh. If the ghosting is a problem to you I’d suggest changing the setting to refresh every 3 or 4 pages. Altering this will however have a slight impact on battery life. On switching the device on you are faced with your Home Page. On this page you have along the top: Library, Store and Reading Life. Reading Life is a feature where you can unlock awards for reading time. You basically get different ranks depending on how much you have read and you can share these via Social Networking – Twitter & Facebook. The main area of the screen is taken up by the books which you have on the reader displayed graphically. Along the bottom you have 3 icons: Settings, Help and Re-sync. There is a hardware Home button on the device which will always take you back to this screen. The Library option will bring up a menu for your Books, Magazines, Previews and Shortlist. Shortlist is handy as it doesn’t have any collection or book list management. The books option brings up all the books you have on the device and you have a button to mark any favourites and you also have a search facility to search for books. You can also change the view. While reading to bring up the options just tap in the middle of the screen. Selecting fonts icon brings up options to change the Font Face (7 fonts plus you can also download extra), Font Size, Line Spacing, Margins, Justification and Kobo Styling. Selecting the options icon brings up another list including: Table of Contents, Update Bookmark, Highlights, Add to Shortlist, mark as Finished, Dictionary and Advanced Settings. The advance settings is where you can change the refresh page rate from the default six down to as low as one. To look up a word just tap and hold and then select the A-Z icon at the bottom which brings up a definition of the word. It uses the Merriam-Webster Dictionary. To highlight a word tap and hold again and then move the sliders until you have highlighted what you need to and then hit the Highlighting icon. Turning the pages is done either by tapping on the side of the screen or swiping. there are no physical page turn buttons. Once you have finished reading click on the home button to take you out and the book will automatically be book-marked. The pdf reader on here is pretty good and features both a portrait and landscape mode. There is a zoom facility as well where you just move a slider to zoom in and out, which is pretty neat. There is also legend that tells you where you are on the page. You can also scroll around the page. Page turns are pretty fast as well. You can also view images on this device and the quality is good. It treats each image separately though so you can’t do a slide show. As mentioned earlier there is no audio player on this eReader, so you won’t be able to listen to your MP3s or buy audio books. The Store option on the home page has: Store Front, Categories, Free eBooks, Top Picks and Search options. The store front gives you various Bestseller Lists, Great Reads under $4.99, Free eBooks and a Search facility. Selecting a book gives you a Synopsis of the book, Rating for the book, Preview Book where you can download an excerpt of the book and a Buy Now button. The Kobo Touch has a webkit Web Browser. This took me a while to find. Select Settings > Wireless Connections > Launch Web Browser. Strange place to put the browser. Once fired up you can click on the icon in the bottom right hand corner to bring up a menu with: keyboard, Go Home, Favorites, Add to Favorites and set page as Home. It’s pretty quick but like other eInk readers it isn’t really suited to surfing. It refreshes several times as it loads up pictures. I’d only recommend it for downloading public books or just light surfing. You do have a zoom facility and you can move around the page. You have back and Forwards buttons and a refresh button. The onscreen keyboard for entering the URLs is pretty responsive. Downloading books via the web browser or Book Store is quick and I was finding it was taking less than 30 seconds on average. The quoted battery life is 1 month and that’s with reading 30 minutes per day and Wi-Fi turned off. That’s the same as the Sony and basic Kindle 4, but half that of the Nook Simple Touch and the Kindle Touch and Kindle keyboard. In general use I was getting around 2 -3 weeks compared to around 3 -4 weeks for the Kindles and Nook. Memory is 2GB as standard which is the same as the Nook and Sony, but not as much as the Kindle Touch or Kindle Keyboard’s 4GB. It does have the advantage of being upgradeable (32GB max) which the Kindles don’t have. This is a Wi-Fi only device. I found downloading books was quick on this device and Internet browsing was equally quick. 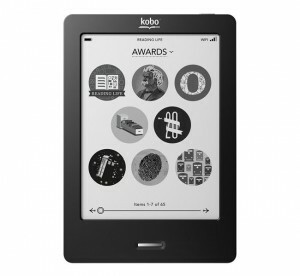 The Kobo Touch is only available online from Amazon, Best Buy and Target. I found the cheapest is Amazon at $120 and $129.99 at Best Buy and Target. The new Kobo Touch is a definite improvement over the previous model and is a perfectly good eReader. The problem is that the eReader market is very competitive and Amazon, Barnes & Noble and Sony have all recently updated their devices as well. While it is a perfectly good device to read books on, has a wide range of books via the store and looks good, it does lack the features of some of the other eReaders around and isn’t as slick. The addition of the recent ad-version is a welcome sign and takes it to equal billing with the Kindle Touch and Kindle keyboard and also the ad-free Nook Simple Touch. Unfortunately, it isn’t quite as good as those readers.